Even though everyone defines fun in a different way, you can bet that teenagers having fun are participating in activities that build bonds with friends, involve action and excitement, and create strong memories. 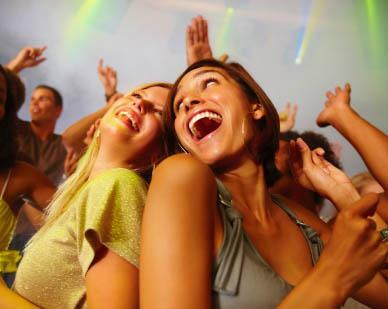 Parties: Having parties or gatherings with friends on a regular basis is a great way to have fun. Think of doing theme parties and dress up parties throughout the year. Music and Entertainment: Going to movies, concerts, singing karaoke, or even dancing in your living room is fun. Video Games: Since most of these games are made for teens, they will evoke a sense of fun. It's even more fun to play video games with friends. Sports: Participating or watching a sporting event is fun and memorable. If you've ever noticed the intensity of being a spectator at a sporting event (versus watching it on TV), you'll know that fun times are elevated in a big crowd. Shopping: Finding those great bargains or coming home with some of the latest fashions can be fun, especially when you anticipate where you might wear those clothes. If you need more fun in your life, try buying more clothes for fun events and you'll find excuses come up to wear those outfits. Amusement Parks: There are small and big parks with rides that can put a big smile on your face. Even silly things like bumper cars and fun houses are amusing. Time with Friends: Nothing compares to the fun you can have with a group of close and trusted friends. Sure, there are superficial things that can make a person popular (such as looks or money), but when it comes down to it, people who truly feel good about who they are deep down are the most fun. They are willing to clown around, try something new, and more accepting of others because they also accept themselves. They seek out fun: Fun people know that amusement can be found anywhere. They laugh a lot: Fun people tend to smile and keep a positive attitude. They roll with the punches: Fun people don't get caught up in problems for too long. They know that fun is contagious: Fun people involve friends in the action. Don't believe the hype that everyone is having fun and happy all the time. Most people only show who they are on the surface and keep their private feelings and emotions to themselves. You can bet that everyone has good days and bad days. So, have fun, but also realize that the journey is much sweeter when you're willing to embrace both sides of the coin.